The Samsung Galaxy Tab Pro 10.1 feels like it contains a misnomer: sure, there are professional elements contained within, but this is a direct rival to the likes of the best consumer slates out there. The Galaxy Tab Pro 12.2 and Galaxy Note Pro 12.2 may overshadow the competition thanks to their sheer stature, but the Galaxy Tab Pro 10.1 and Tab Pro 8.4 provide a strong backbone to the new "Pro" range. Samsung's Galaxy Tab Pro 10.1 sits quite firmly against the more traditional tablet, aiming to take a hefty swipe at the dominance of the iPad Air, the Sony Xperia Z2 Tablet and Microsoft's own Surface 2. Even Samsung's own Galaxy Note 10.1 2014 can't be ignored given a similar spec list and the extra S Pen. And here's some even better news: Samsung seems to have quickly realised its own mistake in making the Pro an expensive tablet, dropping the price to as low as £320 if you shop around, although a £380 ($319 in the US, around AU$340) price tag seems to be the norm. You could make a case for the Tab Pro 10.1 to carry an even higher price tag than the iPad Air given its marketing angle. The "Pro" moniker definitely hints at the business market, aimed more as a working tablet than for casual web browsing in front of the television. This is backed up by the inclusion of Samsung's e-Meeting and Remote PC apps, as well as Cisco's WebEx. That said, casual users will be drawn to Samsung's offering thanks to some hefty internal grunt and a suitably impressive screen. The Samsung tradition of eschewing metal products for a plastic back is continued in the white Tab Pro 10.1 I have in my hands, as is the same faux leather and stitch effect on the rear that was first seen on the Galaxy Note 3. Initially I found this to be a bit disappointing but the textured plastic is actually rather pleasant to hold and I soon found myself drawn to the stitch effect. Love it or hate it, it's nice to see Samsung trying to break away from a traditional slab with a nod to the leather bound notebooks of old - and with the lower price tag, this seems to fit better. It's not a premium feel, but it's a good one for gripping in a landscape mode. 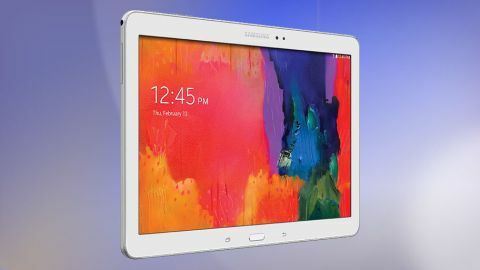 Samsung has elected to offer the Galaxy Tab Pro 10.1 in both black and white, with the review model I had being the latter. In terms of a "pro" offering, I do feel that the black version is far better suited, as the white plastic seems like it would fit far better on a coffee table rather than at a desk. Wrapped in a 243.1 x 171.4 x 7.3mm frame and weighing a mere 469g, the Tab Pro 10.1 is easy to hold for long periods of time. The bezel also fits neatly between slim and stylish, whilst staying wide enough to allow a decent grip without leaving thumbs all over the screen. This is a good call because there is no doubt that the Samsung Galaxy Tab Pro 10.1 screen is easily one of the best on the market. The 2560 x 1600 resolution leaves a density of 299ppi, higher than the 264ppi of the Retina Display on the iPad Air. This resolution matches that of the Asus Transformer Pad, however the screen felt brighter, meaning a more pleasant viewing experience, and one that was less strenuous on the eyes. I did find that there was the occasional problem with the auto-brightness coming out too dark even when adjusting the toggle, so I tended to keep the brightness on its maximum setting. This is a problem that I also found on the Asus and will hopefully be fixed in a software update. Other hardware matches up to this high standard, with 2GB of RAM supporting an octa-core Exynos CPU. This is made up of four cores clocked at 1.9GHz and four smaller 1.3GHz cores. Samsung has also opted to go for a traditional button layout, with the physical home key being flagged by the back and multi-tasking buttons. These are at the bottom when the Tab Pro 10.1 is held in landscape, something that makes more sense as I found that I held the tablet in landscape pretty much all the time. The 2MP front facing camera sits in the opposite bezel, making a lot of sense for video calling. A rear facing camera is also included packing a total of 8MP, alongside a flash. I've never been an advocate of using a tablet as a camera, using it out and about felt more than a bit ridiculous, but the generous offering means that the Tab Pro 10.1 could prove to be a decent alternative to having to search through drawers to find your compact. In terms of speakers and ports, the Galaxy Tab Pro 10.1 includes a microUSB port on the centre of the base, ideal for charging whilst using the tablet. The left and right sides house a dual speaker system, something I was equally impressed by as the speakers sat just above where I placed my hands. Below the right hand speaker is the microSD slot, whilst the headphone port sits above the left. This left the power/lock button and volume rocker to be placed along the top, sitting relatively flush but standing out enough that I never found any problems in hitting them. An infra-red blaster also seems to be included but the lack of Samsung's WatchOn app left me a little confused. Overall though, it's clear that Samsung has given its tablet design a lot of thought - albeit one that still doesn't hold a candle to the likes of the iPad Air or even the Sony Xperia Z2 Tablet, which has a more angular and industrial design. Given the price differential between the Tab Pro 10.1 and the rest of the competition is now more marked, this is less of an issue though. Just make sure you hold Samsung's tablet before purchase - the icons on the bottom of the screen and the plastic casing will feel a little poor to some.